Welcome to Budapest, in the heart of Europe, in the middle of a fairy tale! Budapest is one of the most mystic, enchanted and romantic cities along the Danube river. As the capital of Hungary, this is a centre of everything you want to find in this welcoming country. At the same time, like the heart of Europe, you will find Budapest in a lovely, caothic way as in the East, a little precise, like on the West, as modern as the North with a little touch of the Souths. Join as and we will show you this fabolous side of the capital, while floating on the Danube river, underneath the Bridges, and you will be able to admire the panoramic view and the most famous places of Budapest. During sightseeing on board, on the Danube you have the chance to admire wooded areas and hills of Buda with the unique Matthias Church and Fisherman’s Bastion. 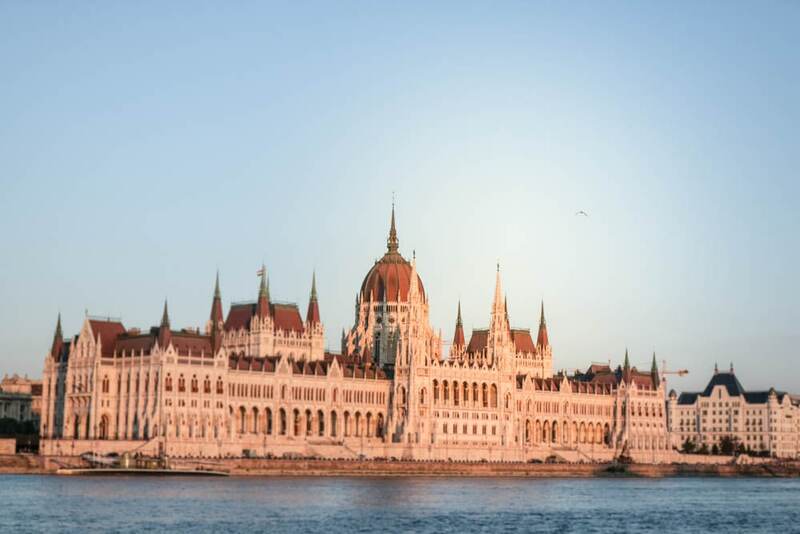 The other side of the Danube, called Pest you will see the nicest and most-known building of Budapest, Parliament as the third largest ones in the world designed by Imre Steindl. The wonderful panorama gilded by flowing bridges of Pest and Buda, from which four are also the parts of UNESCO, namely the Margaret Bridge, Chain Bridge, Elisabeth Bridge and Liberty Bridge. So it is not an exaggeration to say during enjoying Budapest river cruise, you must stare the breath-taking Danube panorama as a so-called incomparable scene throughout Europe. 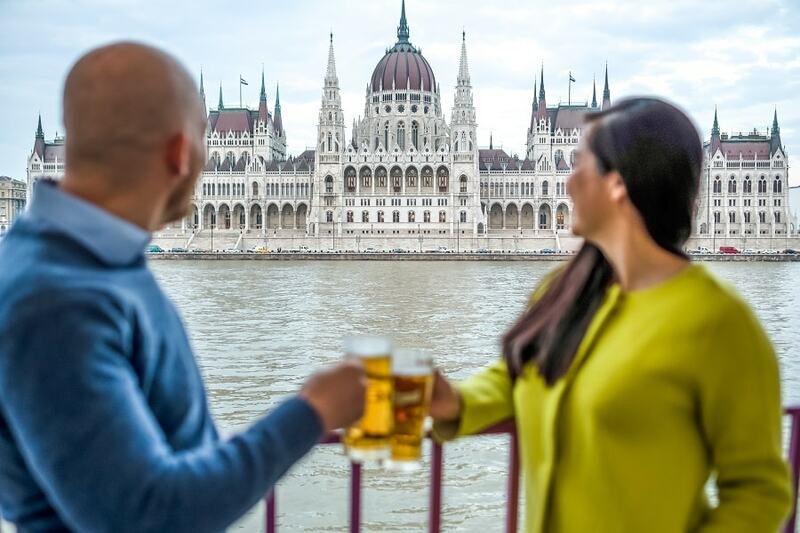 Budapest river cruise offered by Silver-line provides excellent choice to celebrate some special occasions for example a wedding anniversary, birthday, Valentine’s day or any other remarkable feasts, having a luxurious Budapest river cruise with tasty dinner, enjoying elegant live show. All our Budapest river cruise programs are available in winters and summers, too. Luxurious catamaran is heated in winters but air-conditioned in hot summers so we are always able to provide you to feel the maximum comfort. Join us and have an unforgettable journey! Seasonal Budapest river cruise, having various themes provide you to choose the perfect program from a simple sightseeing tour to a whole night dinner cruise with piano or folklore show and so much enjoyment. 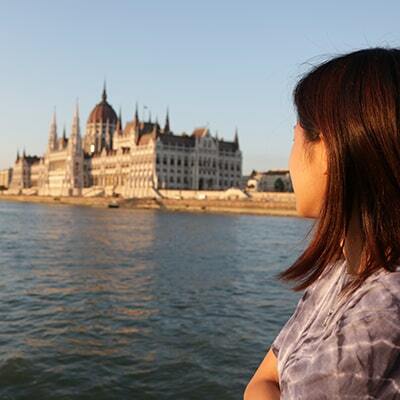 Each Budapest river cruise program guarantees unforgettable experiences for guests. Choose the most favourable Budapest river cruise program and be the part of a so special treat never to be forgotten. Budapest danube cruise with delicious dinner and piano show is one of the most popular sightseeing tours. As having a proper cruise, lasting for 3 hours, you might have the possibility to admire beautiful lights of the city at night. Also wonder how lights of the Parliament are shining on the river as the whole Danube is in a bath of glossiness. 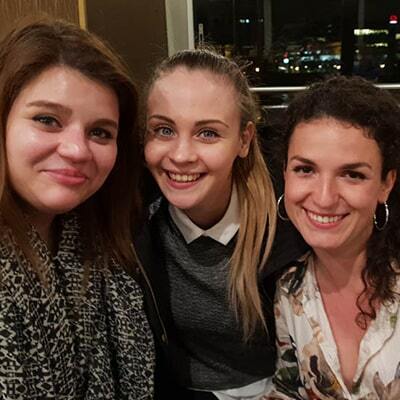 While cruising at night, having dinner and sightseeing, two fantastic pianists and a talented songstress are always taking care of pleasant and romantic way of feel. Once it is dumpish, once it is cheery with well-known songs and beloved by all. The second part of cruising is about pianists fighting with each other, speeding the glorious feeling. During the 3-hour candlelit danube cruise, attentive waiters are serving the delicious 4-course menu with chosen desired dish. Live piano show by sightseeing cruise starts at 17.30, lasting 22.30 so you have the chance to admire not only the beautiful lights of Budapest at night, but also you will have the wonder of impressive sunset. After one and a half hour, the boat is coming back so while enjoying dessert, you will have the opportunity to watch the other half of the city, too. By the end of the fantastic night, the boat is arriving back to the Dock 11. I am surely guaranteed, you will have the most memorable night with us. Songs, sights and tasty dishes in perfect harmony give you an excellent relaxation, indulging your mind. 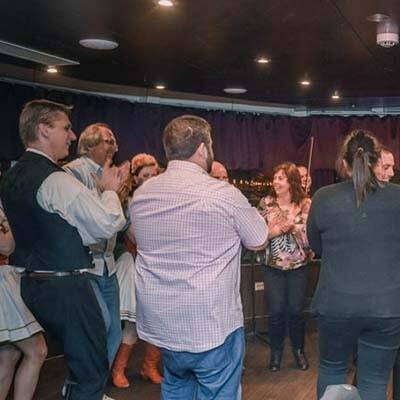 Sightseeing and river cruising with dinner and piano battle show is an elegant or romantic surprising program for your each loved member. Dinner cruise with operetta and folklore show is one of the most popular sightseeing tours. As having a proper cruise, lasting for 3 hours, you might have the possibility to admire beautiful lights of the city at night. Also, wonder how lights of the Parliament are shining on the river as the whole Danube is in a bath of glossiness. 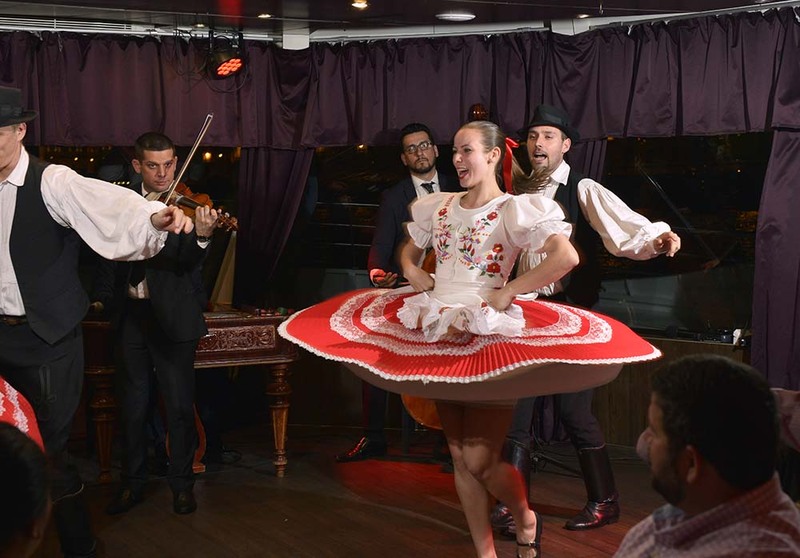 It is a whole night dinner Budapest river cruise with an entertaining and cultural program, where you could admire the most wonderful sights of the city centre, getting an inside view of the Hungarian folklore and operetta world. Due to the talented folk dancers and operetta singers during one night, you will experience the Hungarian culture. After the breath-taking show with traditional folk clothes worn by presenters, with the help of dancers, you can also learn some folk dance steps so at the end you will get a piece of the Hungarian culture by our special Budapest river cruise. During the 3-hour joyful river cruise, our waiters are serving the delicious 4-course menu with a chosen desired dish. 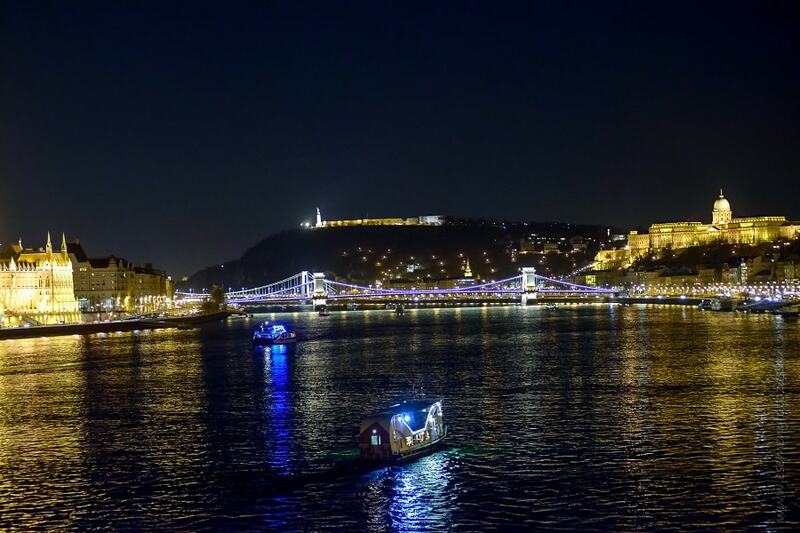 Dinner cruise with operetta and folklore show starts at 19.30, lasting 22.30 so you have the chance to admire not only the beautiful lights of Budapest, having enjoyment show at night, but also you will have the wonder of impressive sunset. After one and a half hour, the boat is coming back so while enjoying dessert, you will have the opportunity to watch the other half of the city, too. By the end of the fantastic night, the boat is arriving back to the Dock 11. 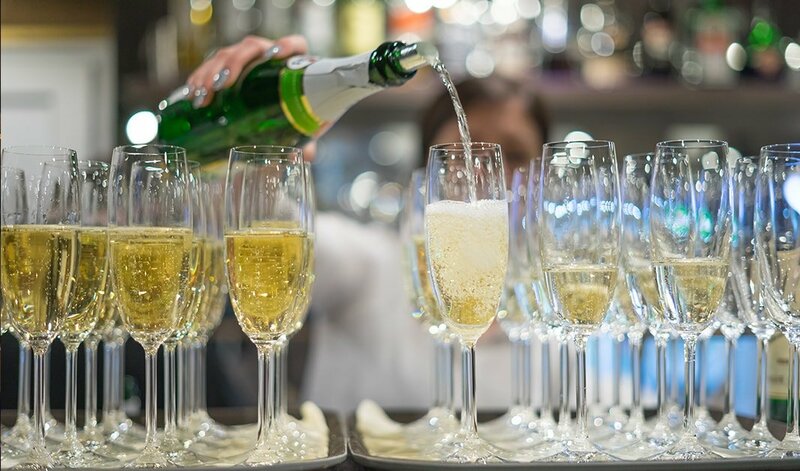 I am surely guaranteed, you will have the most memorable night with us. Songs, sights and tasty dishes in perfect harmony give you an excellent relaxation, entertainment without age limit, lovely welcomed by the youth and the elders, too. Dinner cruise with operetta and folklore show is a perfect program, staying in Budapest for the whole family. Pedestrian precinct of Budapest and especially the city centre provide interesting sights for each tourist. But do not forget the crowd while reaching all spectacles. Actually, crowd can be avoidable by choosing sightseeing cruise. It is not an exaggeration to say that Budapest is one of the most magnificent sights by the Danube view. The panoramic view, especially its cultural and natural uniqueness, of the Danube coast and bend of Budapest certifies that we are among the list of UNESCO World Heritage. These places of interest are really unmissable of a Hungarian vacation, staying in Budapest. During the 75 minutes of simple sightseeing boat tour we invite you, your friends and family members to admire the Buda Castle, Parliament, Fisherman’s Bastion and several other places of interest in Budapest. Sightseeing boat tour is available in several different languages by audio guide with which we are gazing at the breath-taking sights, learning more and more interesting facts of the city, buildings and historical elements, too. In case you might be hungry during cruising, our snack bar offers you delicious street food options. Sit back in comfort, enjoy cradling by boat, touching your face by warmish wind and experience the wonderful panoramic view of Budapest. Pizza and beer cruise is one of our options for Budapest sightseeing cruise. 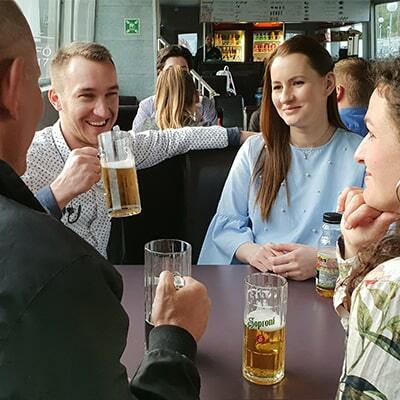 The price of pizza and beer cruise includes not only sightseeing ticket but also a whole pizza (26 cm) with optional choice and unlimited beer and drink package. See the most desirable panoramic views of the city, having a tasty pizza and some cool drinks. Have a nice dinner with your friends, family members even colleagues meanwhile having a 75-minute sightseeing Budapest boat tour. 20th of August is the greatest national holiday in Hungary, celebrating St. Stephen’s Day, commemorating the foundation of the Hungarian state. On this day everywhere in Budapest and other Hungarian cities are waiting for visitors with festival programs. Dome hall of the Parliament is opened where the Holy Crown of Hungary can be seen even several concerts are organised and held in other parts of the city. The top of the day is actually about the breath-taking firework over the Danube. From all over the country, many people visit Budapest to see the main attraction. Join us and celebrate on the 20th of August on board by cruise, watch the most significant firework of the whole year in premium seats of the luxurious boats. By the special and festive cruise, first we are travelling a smaller trip to the Margaret Island so you have the chance to discover all places of interest from the Danube. While cruising, waiters are serving the 4-course menu with delicious dishes, enjoying a live piano battle show, speeding the way of feel. By reaching the Margaret Island, we are coming back to the Batthyány square, from where as the final attraction you will wonder how amazing the festive firework is. 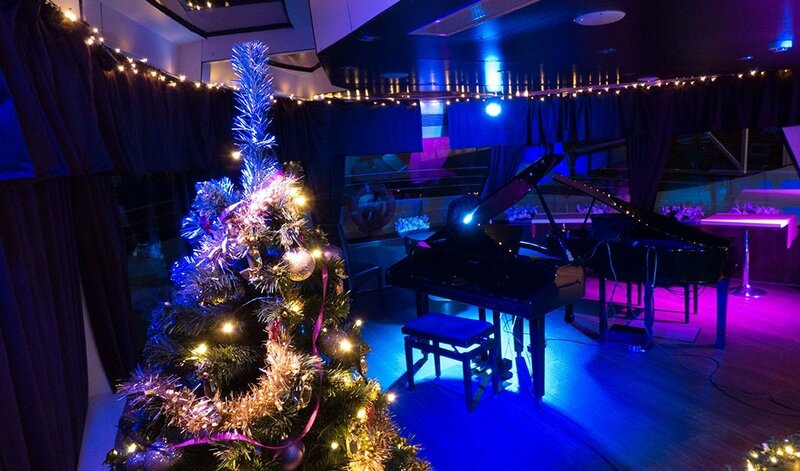 Celebrate Christmas Eve on a luxurious catamaran, decorated beautifully. A special night, cruise with homelike Christmas feeling is offered for you and your partners. We are inviting you for a unique and delicious 4-course menu with festive live show on the first day of Christmas. Miracle lights of Budapest, tasty dishes and candlelit dinner with live show are guaranteed in order to have a memorable and intimate event. Nothing is more romantic than spending a candlelit dinner together with your partner, watching and listening to a live piano battle show, amazing in sunset and wonder the shining lights of Budapest, enjoy cradling by boat. Surprise your partner on Valentine’s Day by a special and luxurious danube cruise, having a nice dinner. On this occasion, called Valentine’s Day cruise, we provide all conditions for you to spend an unforgettable night with each other on board. So release yourself, we will organise everything. Tables are decorated with rose petals, coloured champagne, heart-formed starters and desserts are served to all of you. As a demand, a unique surprising package could also be offered for you, including a nice red rose, two heart-formed “Szamos” marzipan dessert even a perfect photo taken as a remarkable memory from this fairy tale night. Greet the New Year on a luxurious catamaran! 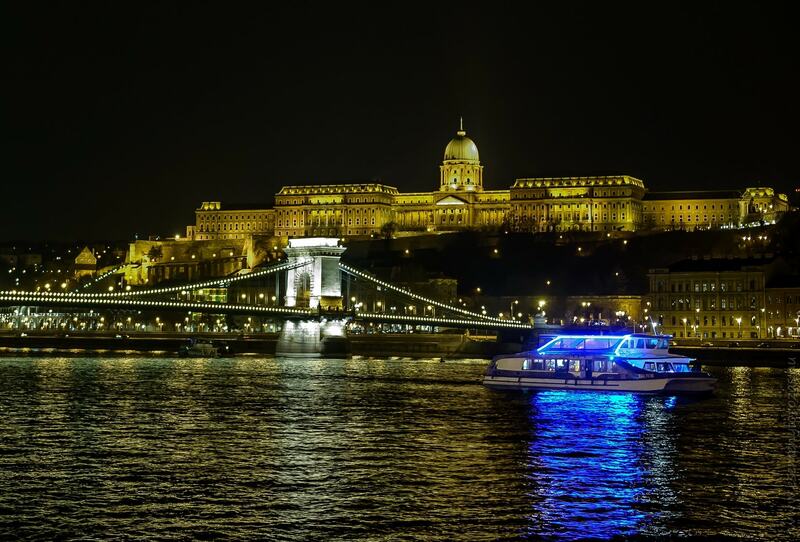 Increase joy at night with our Budapest cruise with dinner and say goodbye the year from the middle of the Danube! 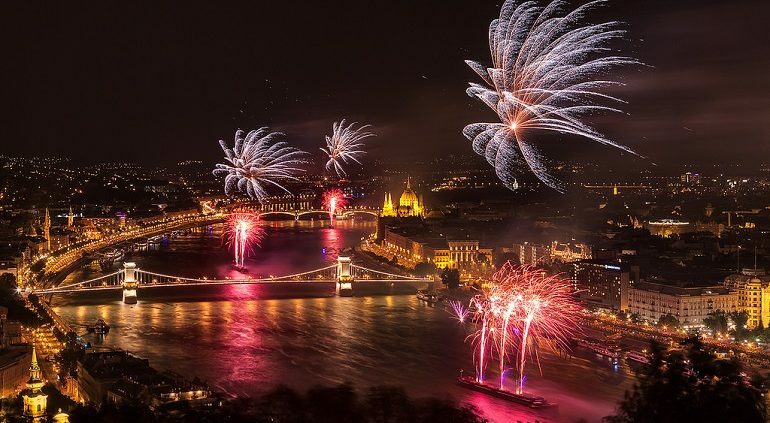 As a proper alternative program, we are offering Budapest river cruise on New Year’s Eve to close the exact year. Magnificent dinner and miracle lights of the panoramic Danube with a live piano battle show, providing a complete entertainment on the last day of the year are waiting for you, too. At the minute of midnight in front of the Parliament, from the middle of the Danube, you have the great opportunity to cheer and wonder the festive impressive firework. Join us on New Year’s Eve and close the year with a miracle night! According to a saying, the way you spend the first day and with whom especially will be determining for the next whole year. So join us on the first day of the year and make sure your next year will be as fantastic as spending the night with us. 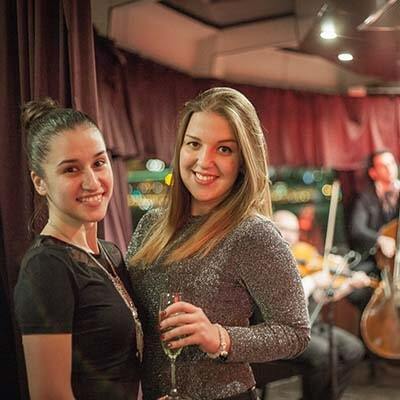 We are waiting for you on luxurious catamaran with the panoramic Danube, delicious 4-course dinner and live piano battle show. 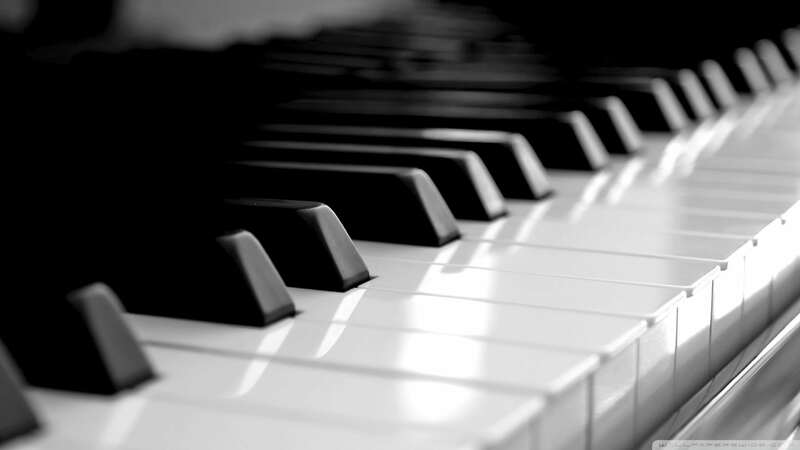 Pianists ensure some well-known and common songs to make a pleasant feeling. So sit back and relax, we will guarantee everything to enjoy Budapest danube cruise on the first day of the year. Choose from our various and different cruise programs and be the part of an unforgettable experience you, too! Highlight of our break! 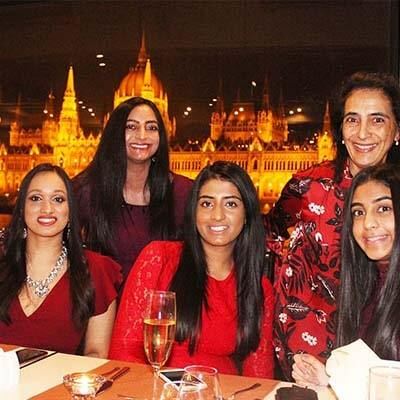 We decided to spend the last night of our break to Budapest taking a dinner cruise along the river, with six of us in total, we had a fabulous fun evening. We booked the unlimited drinks package, which was definitely worth it, champagne, wine etc which was regularly topped up. The 4 course dinner was really lovely & tasty. Recommend booking a window table, the views are beautiful when the buildings are all lit up at night. The musicians were fantastic who played throughout the evening, & the singer & dancers put on a great, enjoyable show. Was a highlight of our break in this wonderful city." 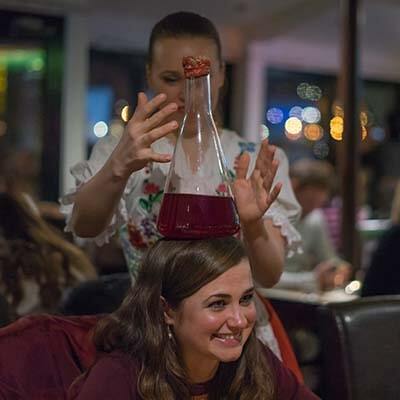 "Four-course dinner with a choice to pay an extra €20 for unlimited drinks. Drinks included all varieties of house wine, beers, tea/coffee and soft drinks- not forgetting the complimentary glass of champagne on arrival. The dinner was lovely with a choice of five mains to accommodate for vegetarian/vegan. All four courses were delicious. The staff were very friendly, professional and attentive. We attended the"piano battle" dinner cruise and both pianists were outstanding with beautiful vocals. The sights of Budapest were breathtaking at night and a really lovely way to see such a beautiful city. There are views only available when taken from the river. A lovely way to spend an evening in Budapest and well worth the money.cross-functional e-markets vis-a-vis effective technologies"
"We spent our evening on the Budapest dinner cruise with a piano show. We booked at their dock station, with a really nice lady, who showed us the boat and the seating. Pianists were amazing, so as the singer lady. The food and service were really good, we had the duck, it was perfectly made. The view from the upper level is beautiful. All in all, really nice evening, highly recommended! Thank you for the night!"